The Casela Nature & Leisure Park is located in the western part of Mauritius between Flic en Flac and Tamarin. The park covers an area of about 14 ha. 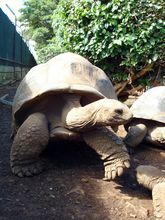 In the park you can see around 1500 birds of over 150 species and a variety of animals such as the impressive giant turtles and various mammals such as lions and monkeys. The park is set up with a variety of beautiful exotic plants and flowers. Moreover on the grounds of the park are located the delicious restaurant Le Mirador and a beautiful lookout point with stunning views over the west coast. Even a playground is situated there to occupy the little ones. Guided tours through the park are not offered but everyone gets a guide brochure at the entry in which are provided briefly descriptions of the individual animals. Duration: You can spend one hour in the park as well as several hours if you take your time to enjoy it. The Casela Nature and Leisure Park is open daily, in summertime from 9:00 am to 6:00 pm and in wintertime from 9:00 am to 5:00 pm. However this is not everything that Casela Nature and Leisure Park has to offer. A variety of activities are offered on the 4.500 hectares large area of the domain Yemen which is also owned by Casela which are inter alia unique for Mauritius. Casela owns about 9 lions of three different generations and four cheetahs. These wild cats have been tamed with great care and affection so that you have the opportunity to get in direct contact with these amazing animals and enjoy the time you spend with them during your visit at the park. The impressive lions and cheetahs can be observed from a wooden platform. The team will give you many interesting information about the behaviour and the work with the wildcats. 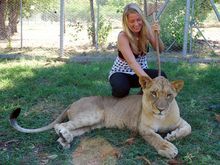 After a brief introduction to the important rules of behaviour which you should follow during the visit of the lions you can touch and stroke the animals. This is truly special and unique in Mauritius. Moreover you even have the possibility to walk with the lions. 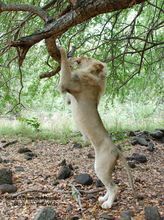 On the walk you can observe the animals in the wild while playing and climbing on trees. The guides will accompany you on the walk and they will give you much information about the behaviour of the giant cats. Back in the park you will get served a refreshing drink as well as a certificate of your experience with the lions. This close contact and the interaction with the wild cats is a very special experience and I can recommend you to take this very rare chance that you will probably never get again. Rando Fun is a real experience for all nature lovers. The Rondo Fun is a perfect mix of hiking, climbing and adventure. After a briefing, a safari bus will bring you in the middle of the mountains of the hinterland of the Casela Park. Here the hike will start together with the nice and funny guides. Expect however not at an ordinary hike. Again and again the Walk offers adventurous surprises. You will have to pass a wooden ladder which crosses an approximately 60 meters high gorge, a Nepalese bridge, knot ropes and much more. As you can see the Rando Fun is not suitable for absolutely fear rabbits. And even if you think that you are none of them, I can promise you that you will reach one or another point where you have to fight against your fear. Therefore it feels so good after you overcome it. At the half time you will reach a waterfall where another surprise is waiting: a zipline which ends up directly in the pool of the waterfall. While you enjoy the cool refreshment, the guides are preparing a delicious barbecue which will be served in a wooden platform in the trees. After the hearty break the second round of the adventure will continue. You will have to cross a canyon by swimming before you finally reach my personal highlight of the Rando Fun: two 150 meter long ziplines which are crossing the breathtaking gorge. The walk ends at around 4:00 pm at the view point of Casela Park where last refreshment is served. The Rando Fun is a unique experience which you will probably never forget! The hike starts at 9:00 am and ends around 4:30 pm. It is also possible to do the Rando Fun as a half day trip and you can also book only individual activities of the Rando fun. Please ask at the reception for more information. The Rando Fun at Casela Park should be booked in advance. For individual activities, please ask for the prices at the entrance. 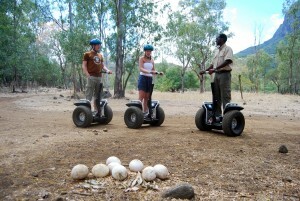 If you like to discover Casela Park in a calm way just take the Segway. It is easy to learn and you do not need special skills. Befor you start the guide will tell you how to use the Segway and you get a helmet. There is no agelimit, the youngest participant were 6 years and the oldest 98 years. There are 2 possible tours and the guide will decide depending on the sportiness. You can enjoy the sounds and the smell of nature, listen to the storys told by the guide about the heritage of the animals and the plants and the history of Mauritius. 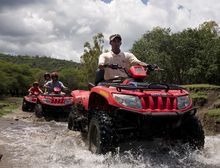 The hinterland of Casela in which the safari tours take place can also be explored by an automatic 400 cc Bombardier quad. 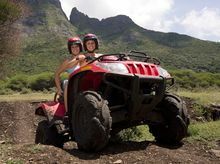 Where else can you get the possibility to cruise on a quad on off-road conditions between zebras, antelopes, monkeys, deer and ostriches? To control the quad on the rocky ground is not as easy as it looks. But don’t worry, before you start the tour in the wild you will get a briefing and also the opportunity to make your fist experience with the quad on a drill ground. 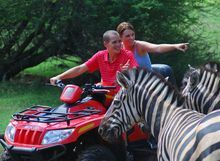 Route 1: This trip takes about an hour and passes through the safari area of Safari Casela. Departure: daily at 12.30 pm. Route 2: This route is a drive of about 2 hours. After you pass through the safari area the trip will continue in the hinterland of the area. This route is not a fixed route. Depending on the skills of the drivers you might even have to pass a river with the Quad. The departure is daily at 9:00 am and 2:30 pm. Route 3: Quad and Swim: First of all, the trip starts with a briefing and an introduction on the drill ground before you start your cruise through the safari area and the hinterland of Casela. After a drive of about 1 and 1 / 2 hours you will leave the quads begin a short hike. The hike includes among others the crossing of the Nepalese bridge. Finally you will reach the waterfall where you can enjoy yourself with the 45-meter long zip line which ends up in the pool of the waterfall while the team is preparing a delicious barbeque for you. After the hearty lunch which is served on a wooden platform in a tree you will drive back on the quads to the Park where you reach at around 1.30 pm. The departure of the quad and swim is daily at 9.00 am at Casela Park. Special 90 cc Kids Quads are available for the young among us (10 to 15 years). Route 1: This route is an off-road drive of about 1 1 / 5 hours through the safari area. 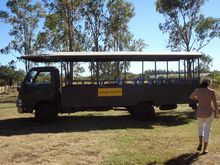 The photo safari passes through the beautiful terrain of Casela in an original safari bus. You can observe zebras, antelopes, ostriches, ducks, deer, monkeys and many other animals. One has the feeling it would be in the middle of a huge nature reserve in the centre of Africa. In any case don’t forget to bring your camera to take some nice shots of the impressive fauna and flora. Duration: The safari tour is a trip of about 45 minutes. The departure is daily at 9.30 am, 12.30 pm, 1:30 pm and 3:30 pm. The Tilapias fishing is a tradition in Mauritius which is offered in the Casela Park under the slogan “catch and release”. The Tilapias fishing is fun for the whole family but particularly the children among us love this activity. Tilapias fishing is offered daily between 9:00 am to 4:00 pm with a lunch break in between. Children will meet in the petting farm inter alia deers, wild boars and cockatoos which they can interact with and even feed. A guide will be available to provide information of the animals and helps the children to feed them. The petting farm is open daily 9:00 am to 4:00 pm. Another activity for the children but also for the elders among us is the mini-golf which takes place on a nice mini-golf playground at the Casela Park. It is truly a special experience to visit the La Vanille Crocodile Farm. 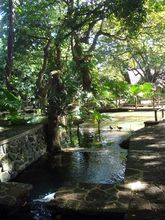 Located in the South of the island (Rivière des Anguilles) this park shows how Mauritius looked like before sugarcane was cultivated. But there is a lot more to discover. You can find crocodiles and a lot of other species in a beautiful surrounding. If you are entering the savanna and turn left you’ll find the Adventure-Jungle-Playground. Especially nice for little visitors. There’s also a petting farm with goats, chicken and donkeys. 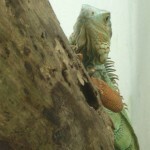 While exploring the park more and more you can see iguanas, apes, bats, chameleons, and a lot more. 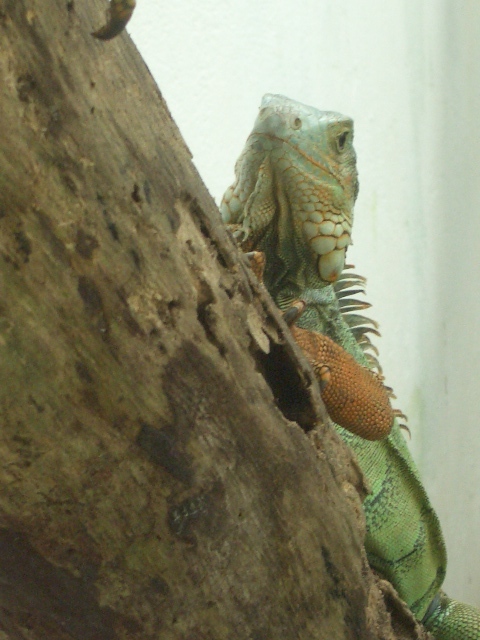 Little exhibitions on the way provide information about the different species. Impressive is also the Insectarium which accommodates a large collection of butterflies, bugs, spiders,… not only from Mauritius but from all over the world. Very friendly staff will help you if you have any questions. You are not allowed to picnic at the park. Within the premises there is a restaurant and also a little shop that sells snacks. At the entrance you receive a map of the park. You can also have information about the feeding times of the crocodiles (1x/week). A guided tour through the park is also included in the price. 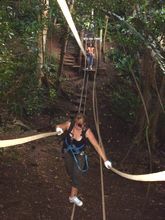 In the middle of the tropical forest, which is spread beyond the southern part of Mauritius, the 12-acre high ropes course Chamarel Parc Aventure is located close to the idyllic mountain village Chamarel. The entire property of the park is beautifully decorated. 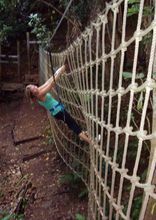 Various challenges in form of wobbly plank bridges, a zipline, climbing nets, and much more is waiting for you in the middle of a jungle. High ropes courses are a popular activity which are applied in incentive programs for supporting team-building processes. 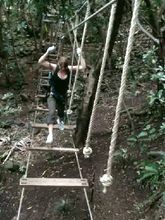 But even just for fun you will enjoy the Chamarel Parc Aventure fully. The tracks consist of two parts. Without a guide you will experience and overcome the tracks with its many barriers of different levels. Generally the level of the park is suited on a broad target group. Nevertheless, I would recommend that a degree of physical fitness should be available. Depending on your desire, you can afterwards enjoy a delicious lunch with stunning views over the mountains of Chamarel in the main building of Parc Aventure. Overall, the tour takes, depending on how fast you are, 1:30 to 2:30 hours. Tip: Make sure to protect yourself with mosquito repellent. Otherwise you will be from top to bottom covered with mosquito bites. If necessary, the spray is available at the entrance for a low price. The park is open from 9:30 am to 4:00 pm. The tours, which run three times a day, must be booked in advance. Phone: +230 2345385 / 2344533 / 7270869 Fax: +230 2345866. The Chamarel Parc Aventure is located next to the 7 coloured Earth. You must take the entrance to the earth where a road is leading you to the Chamarel Parc Aventure. Tell the ticket seller that you want to go to the Parc Aventure. Then you don’t need to pay the entry of 100 Rs. Pay attentions to signs. After about 5 minutes you will find a small road on your right hand side which leads you directly to the high ropes course. 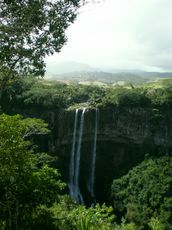 The Black River George National Park is the only one in Mauritius and it got proclaimed in 1994. The Black River National Park is located in the south-western part of the island and covers an area of 6754 hectares which is representing approximately 3.5% of the total land area of Mauritius. 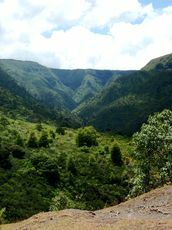 In Black River George National Park has been found before a large number of endemic flora and fauna. It is one of the rarest woods in the world. Of the nearly 700 plant species occurring in Mauritius, 311 you can found in the National Park such as the Trochetia, the Chinese Guava, the Dodotree, the Tree of Travelers, Verbena, Ox Tongue and also colourful plants like Orchids and Anthuria. In Black River George National conservation is actively operated especially is the protection of endangered endemic species like the Mauritius kestrel, the pink pigeon and the Mauritiussittig. Furthermore, introduced species such as Macaques, Tenreks, Red Deer, Roe Deer, Wild Boar, various butterflies and flying foxes also feature to be found in the national park. The Black River George National Park is managed by the NPC (National Park and Conservation Service) from the Ministry of Agriculture and Fisheries. The Mauritian Wildlife Foundation, an NGO at the national level is also involved in the conservation of the national park of Mauritius. The main activity in the Black River George National Park is hiking. The National Park is the largest hiking area in Mauritius with a total paths length of 60 km. Most of the trails are very well signposted and maintained and the level of the hikes covers all different kinds. The main information centre is located in Le Petrin where brochures and other information are available. Entering the park is possible via different entrances. Find a map of the park all the different hiking trails here. A: Via Curepipe / Vacoas or via the Grand Bassin or Petrin. 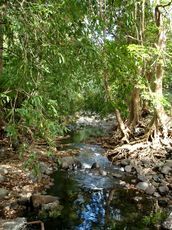 MACCHABEES (Loop) Forest Trail (14 km return): This trail provides excellent opportunities to discover the rarest woods of Mauritius. MACCHABEES Trail (10 km one way): This trail leads up to the Visitor Centre in Black River. It provides some spectacular view points. Mare Longue Loop (12 km return): The Mare Longue loop leads to a reservoir through a primordial dwarf forest. B: Via the Royal Black River Road (Trois Bras). You can use the coastal road which leads from Port Louis to the direction of Tamarin. After you pass through Tamarin and La Prenouse you will reach a curve where you will find another road on the left side which leads directly to the national park. You will find a sign here. After about 5 minutes drive you have a tiny little bridge and shortly there after located on the left side is a very small clear lake. It is worth stopping here briefly. Who feel like having a little dip should take the chance and jump into the clean but quite fresh lake. To reach the National Park you drive approximately 5 more minutes. Finally you will find a large car parking and a small information centre. MACCHABEES Trail (10 km one way): This trail leads up to the Information Center Petrin. It provides some spectacular view points. 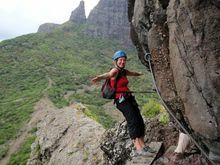 You can also shorten the path of about 1 ½ hours until the first view point from which a beautiful view over the highlands and the west coast of Mauritius opened. Treat yourself to a little brake and try to discover the national bird of Mauritius which can be spotted here. Parakeet Trail (8 km one way): This way you can either start it at Black River Information Center or from the Plaine Champagne Road, which branches off from Chamarel. From Black River it leads to the waterfall in the Plaine Champagne. C and D: From Case Noyale via Chamarel and from Chemin Grenier via Les Mares. Both entrances are connected by the Plain Champagne Road from where the trails in this region start. 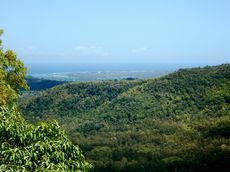 Black River Peak Trail (9 km return): This path starts from the Champagne Plain Road which continues from Chamarel approximately 500 m after the Black River Georges view point. It brings you to the highest peak of Mauritius on a high of 828 m above sea level. 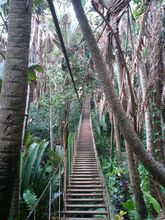 Most parts of the trail are quite easy but involves a slightly strenuous ascents. Savannah (6 km return): The Savanna Trail is rather simple. It provides you with wonderful views of the South Mauritius. Bel Ombre (18 km return): This trail brings you to the southern park border. It is ideally suited to watch native birds and bats. It can also be used as a one-way path to the village of Bel Ombre with a distance of 14 km. From there you can either take the bus or taxi to get back. 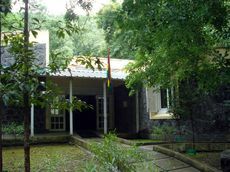 The National Park provides two information centres for visitors. One can be found in Petrin (Entrance A) and one in Black River (Entrance B). The Black River Visitor Center is very simple and does not provide really good information on the park but can you buy a trail map for RS 50. 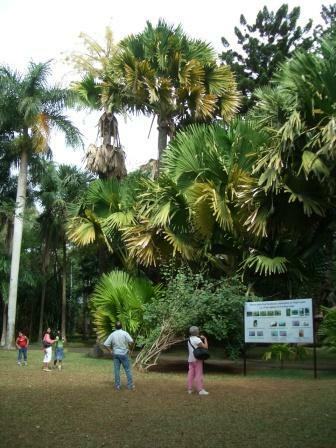 The famous Sir Seewoosagur Ramgoolam Botanical Garden is situated in Pamplemousses, in the North of Mauritius. Right after the entrance of the garden, guides are waiting to offer a tour. (50 Rs/person) It is recommended to take a tour because they make sure that you won’t get lost in the 36 ha park. 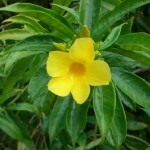 And of course you will hear some interesting facts about the botanical diversity. Mahé de Labourdonnais lived at Mon Plaisir and created a vegetable garden by watering it from the near river Rivère de Pamplemousses. He cultivated a lot of different plants and soon the harvest was considerable enough to cover the need of Port Louis’ population. Later medical and other useful plant species were added. In 1767 Pierre Poivre took charge of the garden and introduced spices and tropical plants. They reached a good reputation and were exported with great success. That lead to Mauritius being a serious competitor for Holland in spice trade. Not only the spices but also ornamental plants were exported to european royal courts. Nowadays the garden is among the species-richest gardens worldwide and even today seeds a nd plants are exported to other botanical gardens around the world. Taking a walk through the garden you will be fascinated by its diversity. 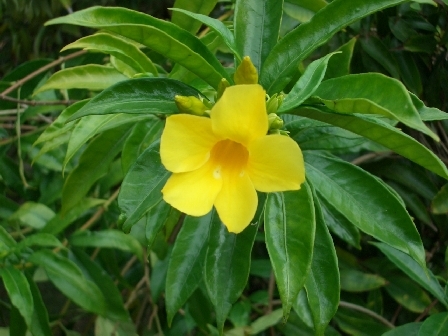 However you won’t find many colorful flowers except of the mauritian spring, which is in october/november. Yet the 80 different kinds of palms and all in all 800 different plants are very impressive. 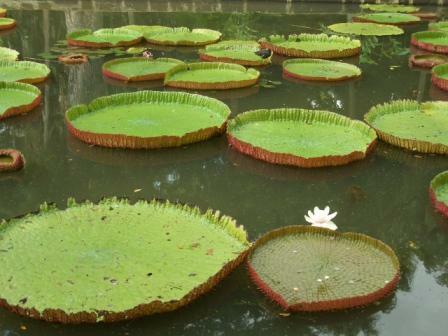 The most famous plant is probably the Victoria regia, the Amazonas Waterlily. It is said that a child can sit on the huge leaves without sinking. The blossom survives only one day and changes its color during this day. In the morning it is white but it turns purple at the evening. If you want to rest after visiting the garden, you should have a coffee at “La Valse de Vienne”. This Viennese coffee house in the middle of Mauritius offers black forest cake as well as Sacher cake. Just sit at the veranda and enjoy the atmosphere. You find the café by leaving the garden parking and turning left. Just follow that road until you have a church on your right. Now you turn right and at the end of the road you will see the small coffee house.